March is being its characteristic self around here. Snow one day, walking weather the next. It loves to keep us guessing. So it's definitely not the end of scarf weather, and that's a good thing because I have a couple more scarf patterns in me! I loved the Sedge Stitch Cowl and Maxi Cowl, and it seemed you did too, so I decided to try it in a child's size. 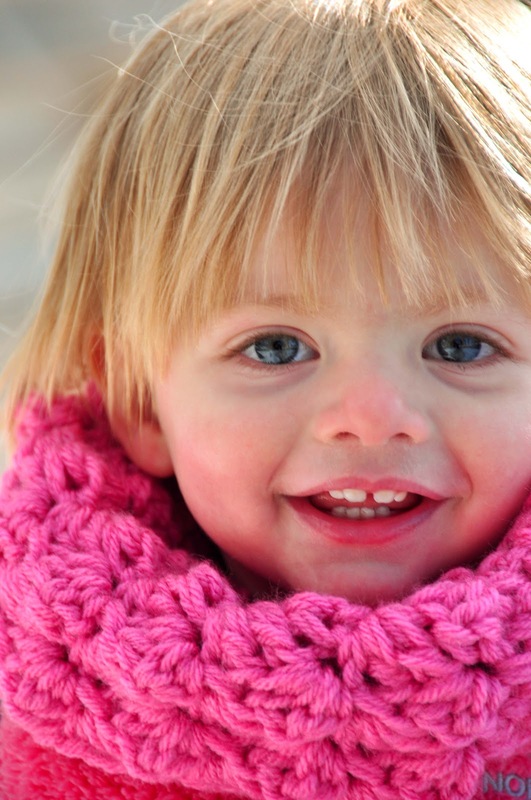 The cowl may be the easiest way to keep little ones warm--no chance of it slipping off. In fact, Tess loves to pull it out of the closet and tug it over her head all by herself. This pattern is perfect for what I'd call an "advanced beginner"--anyone who has practiced a bit and is feeling confident about tackling a pattern. The pattern calls for some basic stitches: chain, single crochet, and double crochet (which I'll be teaching how-to very shortly), but it's the way they're put together that creates this great "sedge stitch" texture. You can view my original tutorial for the Sedge Stitch Cowl here. The child's pattern also includes a photo tutorial to make things more clear. The only tricky thing is counting out the stitch pattern but you'll find that comes pretty easily. Plus, since this cowl is created holding two strands together at the same time it goes very quickly. 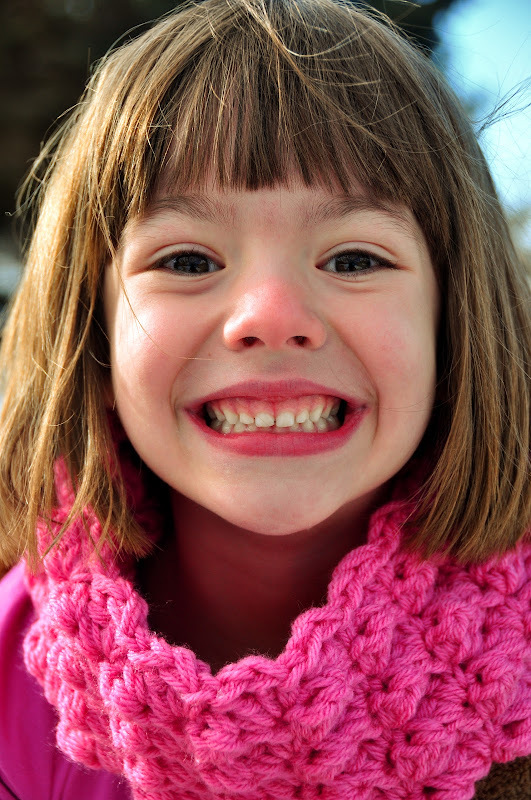 It won't take you long to have a cozy little cowl for some lucky child! The Child's Sedge Stitch Cowl pattern comes in one size to fit most children. You can see this one works great on my toddler, pre-schooler and almost first-grader. It requires two skeins of worsted-weight yarn (category 4). I used Vanna's Choice Baby in Pink Poodle for this one--such a great pink color. Because I want you too to be Head-Over-Heels in Crochet I am offering this pattern in my shop at an introductory 30% off for the rest of the week (through Saturday 3/10/12). Just type in INTRO30 in the Etsy Shopping cart when you are completing your transaction (you'll see a blue link to "Apply shop coupon code"). Anneleise, you have such beautiful girls and wonderful talent! 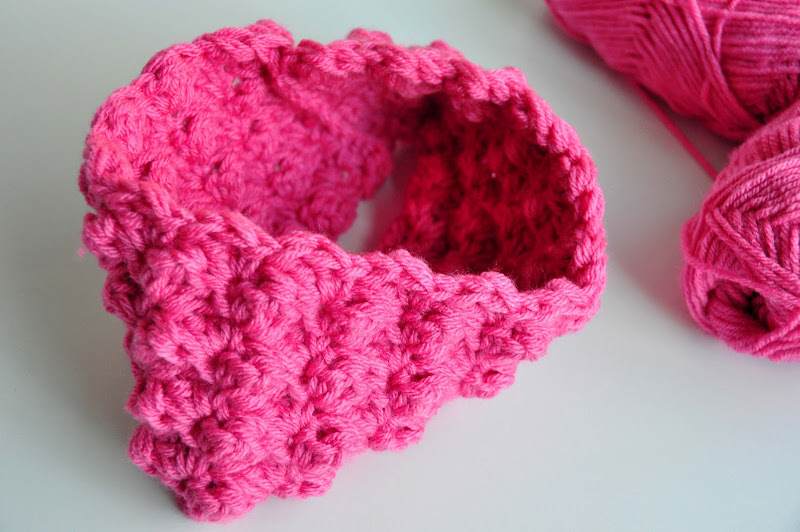 Love the cowl in all sizes!! So cute! Beautiful models, too! 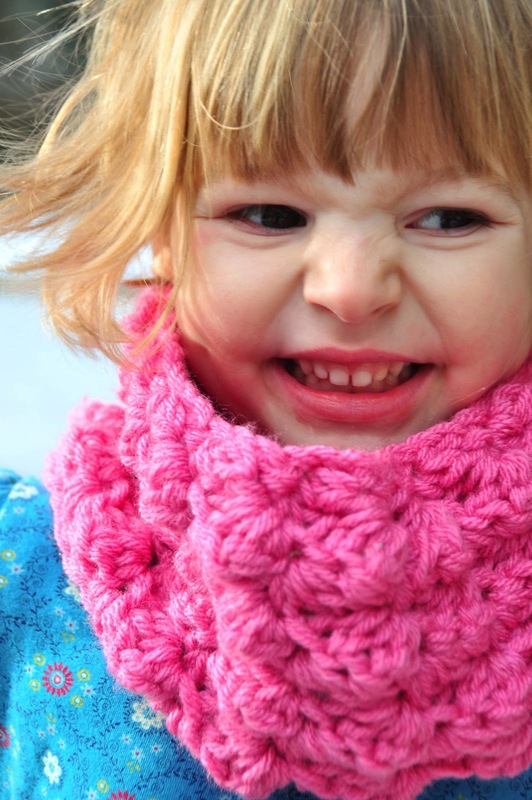 I love this cowl and the cute little "model"!! So adorable.... I love this! The color is amazing!